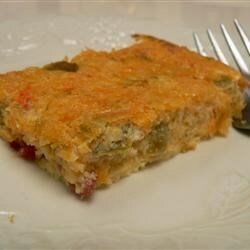 "This is a wonderful baked appetizer blending the tastes of Cheddar cheese and jalapeno peppers. The amount of jalapenos used can easily be adjusted to personal taste, although baking does take a lot of the burn out of the peppers. I've made this several times and I never have leftovers. My husband wishes I would make these for him every day. I don't recommend doubling the recipe; make multiple batches instead." Place the eggs into a food processor, and process until light and frothy. Add Cheddar cheese, onion, and jalapeno peppers, and process until smooth. Pour into an ungreased 8x8 inch baking pan. Bake in the preheated oven until set, 25 to 30 minutes. Cool for 5 minutes; cut into squares to serve. These were good, but once the cool, not as good.....and not so good reheated! But they are good right out of the oven! I added sliced olives. Everyone at our Potluck Players gathering (we read plays once a month) gobbled up the squares! I made this with chopped green chiles and was very good!